NEW YORK—Pace University won the Federal Reserve Bank of New York’s annual College Fed Challenge, a team competition that tasks undergraduate students to play the role of policymakers by analyzing current economic conditions and recommending a course for monetary policy. The team from Pace University defeated eight other semi-finalists during an event held at the New York Fed on Friday, November 14. Rutgers University –New Brunswick finished in second place and Columbia University finished in third. The full competition included 36 teams from around the Second Federal Reserve District. 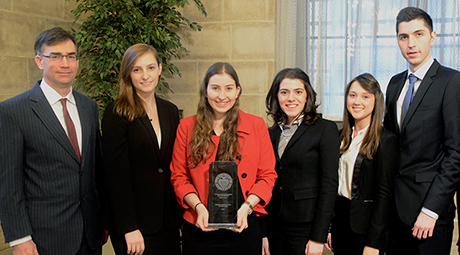 The winning team was comprised of Kelsey Berro, Katherine Craig, Daniella Gambino, Jordan Jhamb and Julia Mikhailova, and advised by Professor Greg Colman. Pace University will now represent the New York Fed’s District at the National College Fed Challenge finals, hosted by the Board of Governors of the Federal Reserve in Washington, D.C on December 2. College Fed Challenge is a competition designed to encourage students to learn more about the U.S. macro economy, the Federal Reserve System and the implementation of monetary policy. The competition brings together teams of undergraduate students to analyze economic and financial conditions, and formulate monetary policy recommendations modeling the Federal Open Market Committee. The New York Fed’s College Fed Challenge is organized by the Bank’s Outreach and Education function. The competition is open to all colleges and universities in the Second Federal Reserve District—New York State, Northern New Jersey, and Fairfield, Connecticut. The winning team will represent the regional at the National College Fed Challenge, held by the Board of Governors of the Federal Reserve System in Washington, D.C.
For more information on the competition, visit the College Fed Challenge webpage.